The Keil™ products from ARM include C/C++ compilers, debuggers, integrated environments, RTOS, simulation models, and evaluation boards for ARM, Cortex-M, Cortex-R, 8051, C166, and 251 processor families. 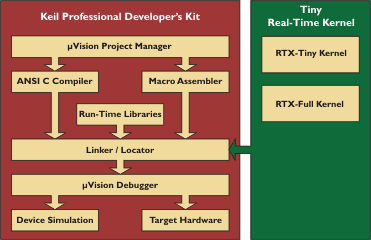 Keil development tools for the 8051 Microcontroller Architecture support every level of software developer from the professional applications engineer to the student just learning about embedded software development. The following chart shows the Keil development tools and how they interface to each other.